Recession is coming. But when? 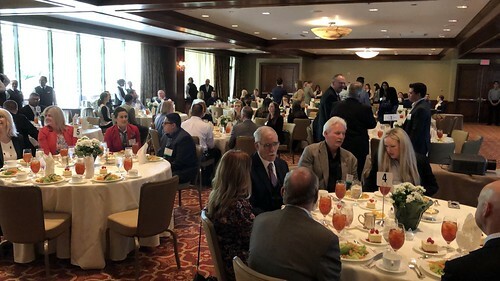 At our March membership meeting featuring Patrick Jankowski, Senior Vice President of Research and Regional Economist at the Greater Houston Partnership, we learned that recession may not be as close as the media wants us to believe. We learned about the overall state of the Houston economy and few key indicators of a downturn to look for so we can prepare for the future. Thank you to our speaker, attendees, volunteers, and our sponsor, Cotton USA, for supporting our first luncheon of the year! Patrick Jankowski is a regional economist and senior vice president of research at the Greater Houston Partnership. He oversees the research department which provides analysis, forecasting and mapping functions for the Partnership. His observations and analysis on the local, regional and U.S. economic trends have appeared in over 400 newspapers, magazines, radio and television broadcasts, including ABC Radio, The Atlantic, Bloomberg Business, CBS Radio, CNNMoney, Financial Times, Forbes, Houston Business Journal, Houston Chronicle, Los Angeles Times, NPR, PBS Nightly Business Report, Reuters, The New York Times, Newsweek, and USA Today. Read his full bio here.